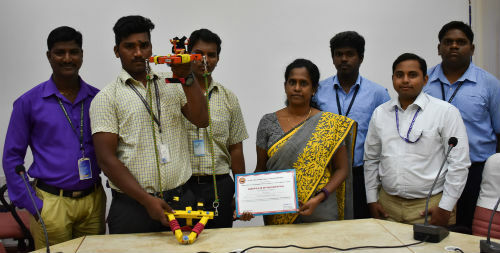 Chennai: Indian Institute of Technology Madras’ Rural Technology Action Group- Tamil Nadu (RuTAG-TN) has launched an annual contest to encourage the development of technologies that will solve problems in rural areas of the country. ‘Rural Innovative TechnologZ’(RITZ) will be an annual event for Polytechnic Colleges in Tamil Nadu with the objective being to tap into the potential of students and faculty members to contribute to solving rural problems. Over 140 students belonging to 26 teams from 17 colleges across Chennai participated in the Inaugural Edition of this contest. They were given three problem statements: ‘Solar drier for agricultural produce’, ‘Mechanized palm tree climber’ and ‘Mechanized vegetable slicer for large-scale rural applications’. The top team in each category will be provided funding of up to Rs. 50,000 each to develop a prototype. The finals were held in the IIT Madras campus today (Wednesday 24th January 2018) in which 11 teams, comprising 42 students from seven colleges, were shortlisted to demonstrate their models. Dr. Muthukrishnaiah, Principal, Dr. Dharmambal Polytechnic College for Women, Taramani, said: I congratulate RuTAG for conducting an event to cultivate creativity in the minds of young people. Such initiatives will encourage students across Tamil Nadu to come up with novel technological innovations for rural areas. Dr. V. Seetharaman, Programme Coordinator and Nodal Officer, Skills Training Programme, Directorate of Technical Education and Dr. A. Senthil Kumar, Lecturer, State Institute of Commerce Education, Taramani also graced the occasion. Solar Drier: Hybrid solar dryer consists of absorber plate, drying chamber, air blower, ventilation and electronics control unit. Absorber plate absorbs as much radiation as possible to generate hot air, which is passed to the drying chamber using an air blower. This removes moisture from the produce. The drier uses easily available materials that makes it affordable at Rs. 27,000. Vegetable slicer: Vegetables are sent one by one to a two-step conveyor from the hopper. Two blades rotate to chop the vegetables into bigger pieces. A piston presses down the chopped vegetables through the blades to cut them into smaller pieces. The piston pressure changes as per vegetable type, while the blades can be changed as per needed size and shape. The setup is estimated to cost Rs. 35,000. RuTAG-TN, IIT Madras, is an initiative of the Office of Principal Scientific Adviser to the Government of India to enable development and dissemination of demand-driven Science and Technology interventions by technical institutions in rural areas. Over the past decade, RuTAG-TN has only interacted with engineering colleges and R&D institutions in order to develop technical solutions for issues raised from rural areas in the sectors of livelihoods, assistive technologies, textiles, health and sanitation, energy. Potential benefits of the interventions include, inter alia, improving quality of life, drudgery reduction, efficiency improvement and optimization of resource usage.